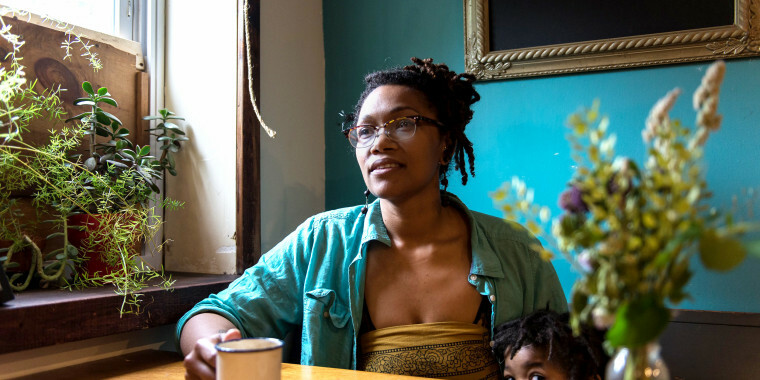 PHILADELPHIA — In nearly a decade of owning coffee shops in the city, Blew Kind has learned the rhythms of East Kensington, her working-class neighborhood that has felt the strain of the opioid crisis and the pull of gentrification. Once in a while, people come into her business, Franny Lou’s Porch, just to use the bathroom, or they sit down without ordering anything. Kind, 30, offers them water and allows them to linger. “Sometimes they just need a place to chill,” Kind said recently, her 3-year-old daughter perched on her hip. The welcoming vibe at Franny Lou’s, where lattes are named after historic leaders of color, presents a stark contrast to the incident that unfolded in a Starbucks a few miles away last month, when two black men were arrested after a white manager called police on them as they waited for a business associate. Now, as Starbucks plans to close more than 8,000 locations across the country on Tuesday afternoon for “racial-bias education” for the staff — which could cost the Seattle-based coffee chain an estimated $12 million in revenue — owners of small coffee shops from Philadelphia to Sacramento, California, see both a financial opportunity and a chance to emphasize their value to the community. 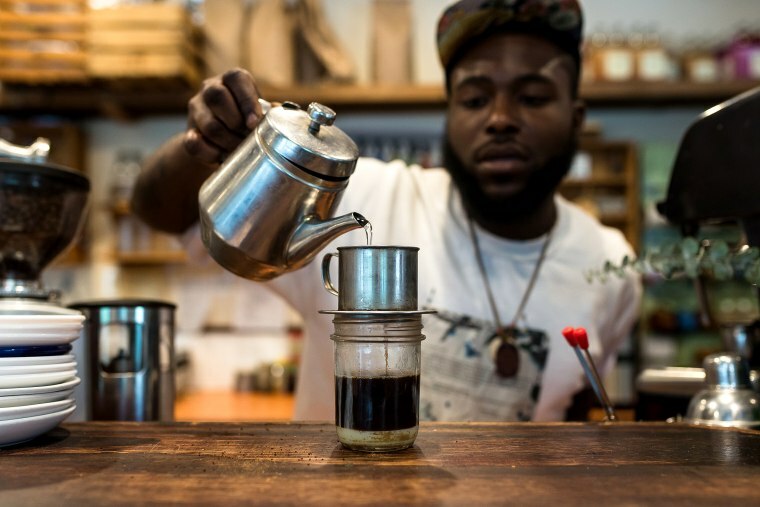 On the same day, Kind and other black owners of Philadelphia coffee shops will take part in a roundtable discussion at Amalgam Comics & Coffeehouse to promote inclusivity and racial justice. She said the arrests at the Starbucks in Rittenhouse Square, a high-income area downtown, got her employees and customers talking. Many were indignant but not surprised that this had happened in Philadelphia, where police have been criticized for disproportionately stopping and frisking black residents. Kind sees it as part of her job to defuse tense situations and respond to customers without judgment. Once, when a man high on drugs tried to fish money from the employee tip jar — so sluggishly that he appeared to be acting in slow motion — Kind responded with laughter, not a 911 call. Only once did she become so fearful that she called police: A man who was harassing her became violent and threw a chair. As video of the Starbucks arrest went viral last month, the hashtag #ReplaceStarbucks became a way for people on social media to share their positive experiences at smaller coffee houses, many black- and minority-owned. Cafes from Durham, North Carolina, to Oakland, California, reportedly benefited from a jump in sales. In response to the controversy, Philadelphia Mayor Jim Kenney apologized for the “trauma of racial profiling,” and Starbucks overhauled its policies, allowing anyone to use its bathrooms without making a purchase as long as they act responsibly. The company also agreed to a confidential financial settlement with the men and asked for their input on diversity and equity efforts. At Tiferet Coffee House, which has three stores in Sacramento, owners Sabrina and Makeda Berhane, who are sisters, said they saw a “trickle-down effect” of new customers last month that turned into repeat business. With a relaxed vibe and locally roasted coffee, it’s the type of place where a young man, a regular, did most of his studying for the bar exam and then brought in Champagne to celebrate when he passed. Sabrina Berhane said the recent community support for Tiferet Coffee House didn’t happen only as a result of it being black-owned, but also because she and her sister are serious about “treating people with kindness and respect,” she said. Among the staff at Quaker City Coffee, a mile away from Rittenhouse Square, the arrests last month at Starbucks were a big topic of conversation. The coffee shop is a for-profit venture that aims to hire workers who are recently out of prison. Jayson McCoy, 21, who grew up around drugs and gangs in West Philadelphia, spent a year in jail for charges including aggravated assault. At Quaker City Coffee, he’s learned to distinguish coffee roasts and to top lattes with the perfect milky heart. Because of his criminal record, McCoy is certain that if he wanted to become a barista elsewhere, he would not be given the chance. When he learned about the arrests of two black men at Starbucks, it was a moment of clarity about his job at Quaker City — this is a place where he is accepted. 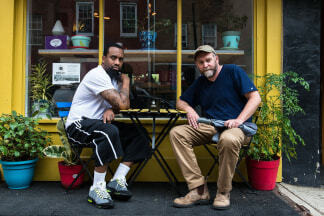 That’s a message co-owners Bob Logue, who is white, and Christian Dennis, who is black and spent time in prison, wish were more universally accepted. 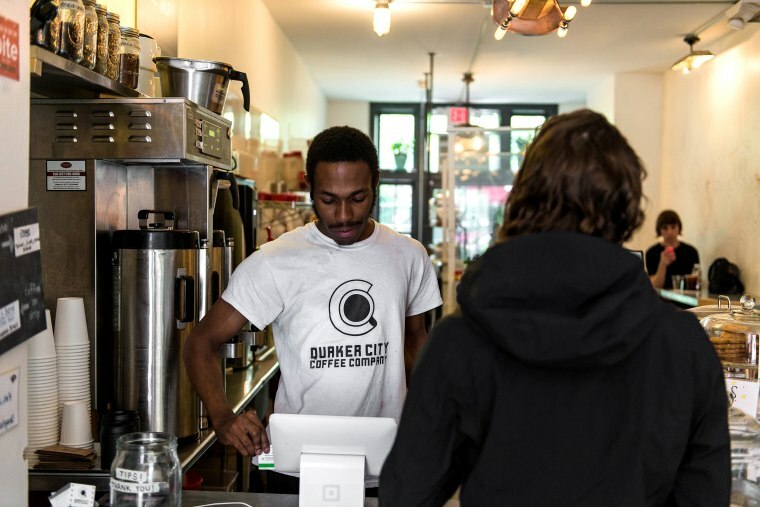 They’ve been disheartened not just by the behavior of the white Starbucks manager but also by former customers, about half of whom have taken their business elsewhere since May 2017, when Quaker City Coffee rebranded and first hired three re-entry employees. The new faces at Quaker City are black — and Logue said he believes some customers abandoned the shop, in part, for that reason. Dennis, 37, who began getting arrested for drug-related offenses when he was a teenager, said the quality and the products didn’t change. “What else would it be?” Logue asked. Dennis said the shop had been “fighting every day” to maintain business, but he and Logue are turning it over to new management so they can focus on roasting, packaging and distribution under the Quaker City brand. Logue, who owns another coffee shop in the city, will move Quaker City Coffee there. Most of his current staff will go as well, including McCoy.